Balconi al Duomo is the ideal strategic point for experiencing Catania and Sicily in the best way. 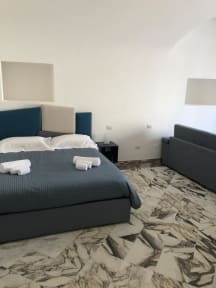 Whether it is a leisure or business stay, our structure will be able to accommodate you at best, and will give you an experience in step with your wishes.Its finest late Sicilian baroque style is, nowadays, declared a World Artistic Heritage Site by Unesco. This charming ancient district can satisfy all your needs making a great and unforgettable stay in our historical Sicilian town, such as: magnificent architectures, night clubs, pubs and restaurants; a glimpse into the past, the history of origin, the Greek period until the present and much more.Visit us! “Balconi al Duomo” is located in the heart of the old town and its main Piazza Duomo in Catania, the best starting point for tourists. After a terrible earthquake, the Piazza with the symbol of the city (a lava stone Elephant topped by an Egyptian obelisk) and the Cathedral, were designed and rebuilt in the 1700s. Guests arriving outside of our working hours will be charged a supplement fee.